Hey. How is that brain doing? Had anything good to eat lately? We were hoping we could talk to you about that some more. We didn’t even get a chance to talk about vitamins last time. Ten minutes, for your brain? Ahh, the brain…40% grey matter, 60% white matter; we say it all matters. Before we get into the discussion of vitamins, there are a few terms with which we should familiarize ourselves. Some vitamins are antioxidants, or molecules that prevent oxidation. Oxidation is a chemical reaction that produces free radicals when electrons and hydrogen atoms are transferred. Free radicals can set off chain reactions in cells that will ultimately damage or kill the cell. 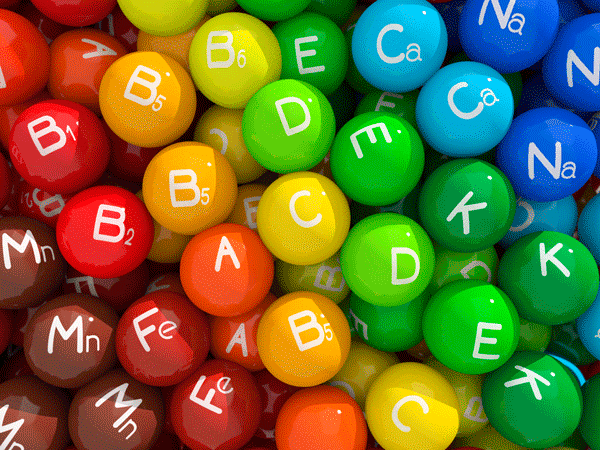 Vitamins can also be classified as water-soluble (B’s and C) and fat-soluble (A, D, E and K). It is important to have a steady intake of water-soluble vitamins in your diet since they cannot be stored and are excreted in urine. Fat-soluble vitamins rely on fat in the intestinal tract to help with absorption. Since they can be stored, fat-soluble vitamins have a greater risk of accumulating to a toxic level in the body. However, that does not mean water-soluble vitamins are harmless; overdoses of some B vitamins cause diarrhea, heartburn, nerve damage, acne, nausea and liver damage. · A (Retinol, Retinal, Carotenoids) – Vitamin A is most closely related to skin and vision health, but it also plays an important role in overall health. Considering so many disorders are related to visual processing, keeping your eyesight at optimal levels will help your brain stay sharp. Vitamin A is an antioxidant and it also helps reduce stress levels, both of which have a positive impact on the brain. As a fat-soluble vitamin, however, toxicity is a risk. Excessive intake can lead to blurred vision, nausea, headaches, irritability, hair loss, muscle pain, fatigue, fractures, insomnia and diarrhea. Assuming you get the dose right, vitamin A can enhance learning and memory by unlocking the brain’s ability to communicate more efficiently. o B1 (Thiamine) – Thiamine is essential for proper function of the nervous system. Deficiency can lead to life threatening conditions like Korsakoff’s syndrome, which causes apathy, neuron damage, amnesia, confabulation (invented memories), impaired executive function and hemorrhaging. Another form of deficiency, dry beriberi, can cause paralysis, changes in sensory perception, loss of coordination, behavioral changes, pain and weakness. Some research also suggests that thiamine deficiency during early childhood will cause multiple developmental problems, notably lifelong language disorders. o B2 (Riboflavin) – This is one of the only vitamins that doesn’t directly affect the brain, at least in the sense that a deficiency will result in visible neurological signs. However, riboflavin is important for metabolism and energy consumption; therefore, a riboflavin deficiency will lead to reduce energy stores for the brain. Less energy means it has to slow down sometimes (obviously, not ideal). o B3 (Niacin, Niacinamide) – Niacin is another major B vitamin that improves health in a variety of ways. Most people may know that niacin reduces bad cholesterol and relieves joint stiffness, but they don’t know how important it is for your brain. Pellegra, a niacin deficiency can lead to dementia, Alzheimer’s, depression, irritability and inattention. Niacin helps prevent and treat diabetes, especially in children. Niacin also boost energy, aids in circulation (which helps prevent strokes) and helps flush toxins out of the body. As if that wasn’t all enough, niacin’s effect on blood flow combined with increased mucus secretion leads to a better sexual experience. Be careful, however, overdosing on niacin can lead to flushing, itching, burning, nausea and liver toxicity. o B5 (Pantothenic Acid) – B5 is an interesting vitamin. It is great for your skin, and having it in your system can even help prevent acne and painful sunburn…heck, some people even use it to help treat wounds. Nobody really knows how much is a good thing though. The daily recommended dosage is no more than five milligrams (unless pregnant or breastfeeding), yet there are reports of people taking over 5,000 mg a day to achieve therapeutic goals. One thing is for sure, vitamin B5 is important in the production of acetylcholine. Acetylcholine acts as a neurotransmitter; it helps lower heart rate, activates muscles, affects sensory responsiveness, promotes REM sleep, aids in memory and may help regulate mood. o B6 (Pyridoxine, Pyridoxamine, Pyridoxal) – Vitamin B6 is a major player in the neurotransmitter world; without it there would be no serotonin, dopamine, norepinephrine or epinephrine. Considering the function of these neurotransmitters, it may come as no surprise that B6 appears to play a major role in depression, anxiety, memory and attention. Pyridoxine is also essential to the production of red blood cells, which carry oxygen rich blood to your organs and muscles. Deficiency can lead to nerve damage and seizures. Unlike many water-soluble vitamins, overdose can lead to serious side effects, including numbness, poor coordination, sensory processing issues, tingling sensations and tiredness. Be careful, you can have too much of a good thing. o B7 (Biotin) – Biotin is necessary to metabolize fats, promote cell growth, and produce amino acids, fatty acids and neurotransmitters. Originally, biotin was called Vitamin H because of its link to hair and skin (“haar” and “haut” in German). For most people, our intestinal bacteria produce more biotin than we can use, which is not a problem since there is no known toxicity. Individuals who suffer from biotin deficiency commonly lack the enzymes needed to extract and utilize biotin from food. Biotinidase (enzyme) deficiency can lead to growth problems, dermatitis, alopecia, perosis (thickening of bones) and fatty liver disease. When holocarboxylase synthetase (a genetic encoder) is missing, biotin cannot be used properly. This usually occurs with multiple carboxylase deficiency and can lead to much more severe symptoms, including hypotonia (low muscle tone), developmental delays, seizures, rashes, coma and death. o B9 (Folic Acid, Folinic Acid, Folate) – Long prescribed to pregnant women, folic acid (or folate) is known to prevent many critical neurological birth defects, including seizures, developmental delays, abnormal gait, demyelination, peripheral neuropathy and spina bifida. Additionally, folate deficiency in adults has been linked depression, dementia, vascular disease, a higher risk of Alzheimer’s and signs of accelerated brain aging and degeneration. Folate deficiency is also linked to high levels of homocysteine, which can lead to blood clots, heart attacks, strokes, fractures, brain damage and a higher risk of schizophrenia. o B12 (Cyanocobalamin, Hydroxycobalamin, Methylcobalamin) – B12 is a common supplement; many people even receive injections from their regular physician. Low levels of B12 can lead to fatigue, inattentiveness, depression and memory problems. Although every cell in your body uses B12, no animal or plant can produce it naturally…you need bacteria for that. It is estimated that 1 in 4 people, and 1 in 2 seniors, suffer from low levels of B12. Unfortunately, persistent B12 deficiency can cause permanent damage, and if left untreated, will prove fatal. Like folic acid, B12 is important for myelin sheath formation and repair, Alzheimer’s, brain shrinkage, homocysteine levels and peripheral neuropathy. In fact, elevated folate levels can mask a B12 deficiency, which could lead to severe and permanent neurological damage. Pernicious anemia, caused by a missing intrinsic factor, prevents B12 from being absorbed by the body. Untreated pernicious anemia can lead to cognitive impairment, loss of coordination, stiffness, cardiac murmurs, shortness of breath, loss of sensation, paralysis and death. · C (Ascorbic Acid) – We mentioned antioxidants before, but it is time to revisit the subject. Vitamin C is one of the most readily available antioxidants on the market. By removing free radicals from the body, vitamin C has an impact on cardiovascular disease, inflammatory diseases, diabetes and brain damage. Vitamin C is a natural antihistamine and it is found in high concentrations in immune cells. Vitamin C has also been linked to lower risk of cancer, gout, cataracts, strokes, the common cold and heart disease. If that wasn’t enough, vitamin C deficiency leads to scurvy, a disease marked by lethargy, spotted skin, spongy gums, loss of teeth, jaundice, fever, neuropathy and death. Because of its vast immunological properties, many people consider vitamin C to be the body’s major dietary defender. Vitamin C is also essential for the production of norepinephrine and dopamine, both essential for alertness and stress reduction. o Bonus fact: Scurvy was so common among sailors that the British (known for their navy) had to study the disease to keep their empire from falling apart. Sailors travelling to faraway colonial ports were not eating a healthy diet that contained fresh fruit and vegetables. A Scottish surgeon, James Lind, discovered the importance of a diet rich in citrus fruits during the what may be the first recorded clinical trial. Although his methods were not adopted for nearly half a century, British soldiers in many of the tropical colonies avoided scurvy through their use of limes. Limes hold up longer on a ship than lemons or oranges, and if not exposed to light, are an excellent source of vitamin C. Other sailors, especially Americans, began calling the British “limeys” for this reason, a name that has stuck to this day. · D (Cholecalciferol, Ergocalciferol) – Well, of course, another vitamin that works in mysterious ways…and yet it works in so many ways. If any vitamin could challenge C as our main dietary contributor, it would probably be D. Vitamin D is essential in skeletal development and maintenance, and deficiency can lead to rickets in children and osteoporosis in adults. Oddly enough, D isn’t really a vitamin in the strictest sense because humans can produce it after exposure to the sun…and still, it is one of the most common vitamin deficiencies. Increased use of sunscreen and a general avoidance of the sun in recent years have left many people struggling to maintain healthy vitamin D levels. A study by Thomas Wang of Harvard Medical School linked low vitamin D levels with an increased risk of stroke and heart attack. These studies are consistent with a University of Heidelberg study that showed low levels of vitamin D led to an increased risk of stroke within the next seven years. Beyond the physical concerns, vitamin D has been linked to dementia in no less than five studies, mood disorders in four and schizophrenia in four more studies. Even multiple sclerosis (MS) may have a link to vitamin D, with a University of Oxford study pointing to a link between low levels of the vitamin and genetic vulnerability to environmental MS triggers. o Bonus fact: A study by Rhonda Patrick, PhD and Bruce Ames, PhD of the Children’s Hospital Oakland Research Institute (CHORI) shows a causal link between vitamin D levels and Autism. Read more in our blog “Want to avoid Autism? Try going out in the sun.” In the blog, we highlight Dr. Patrick and Dr. Ames’ groundbreaking research on Autism Spectrum Disorder (ASD) and vitamin D’s effect on serotonin, oxytocin and vasopressin. Researchers are finally able to explain low serotonin levels in the brain, but high levels in the blood, and the preponderance of male over female autism. · E (Tocopherol, Tocotrienol) – First and foremost, we know vitamin E as an antioxidant; it scavenges the brain for free radicals as it works to keep the fat in our brains from oxidizing (otherwise known as going rancid, which is as bad as it sounds). Since our brains are almost 60% fat and neurons are insulated by fat, it is a pretty big deal. Vitamin E also plays a role in blood flow; therefore, it plays yet another important role in brain health. Unclogged blood vessels carry vital nutrients and oxygen to the brain. As a blood thinner, it also helps prevent strokes and heart attacks; however, vitamin E is fat-soluble, so high doses and residual toxicity build-up could lead to bleeding problems and hemorrhaging. High doses in combination with aspirin have even proven life threatening. But let’s get back to the benefits for recommended dosages of vitamin E. It boosts the immune system and prevents the onset and likelihood of some neurological conditions. A study by the Karolinska Institutet in Stockholm, Sweden has found a link between lower levels of vitamin E and Alzheimer’s and mild cognitive impairments. Deficiency can also cause retina damage, muscle weakness, decreased red blood cell levels, peripheral neuropathy and ataxia. · K (Phylloquinone, Menaquinones) – Research has proven vitamin K to be more essential to brain function than initially thought. Sure, it is an antioxidant and it tells calcium what to do, which is important unless you want that calcium to harden in your arteries (bonus fact: you don’t). More importantly for your brain, vitamin K helps maintain the white matter region of the brain and it protects the myelin sheath around your axons. Multiple sclerosis is notorious for destroying this protective sheath and vitamin K therapy has shown some promise in easing symptoms. Vitamin K is also crucial in sphingolipid metabolism. Sphingolipids are wonderful little compounds that help in signal transmission and cellular interactions. In addition to general cognitive decline and Alzheimer’s, sphingolipid levels have been associated with a host of neuromuscular disorders, including Tay-Sachs disease, Krabbe disease, Fabry disease and Niemann-Pick disease, just to name a few. Deficiency is relatively rare, mostly affecting alcoholics, people taking certain medications, and those who suffer from inflammatory bowel disease, liver damage and cystic fibrosis. o Bonus fact: Although vitamin K is fat-soluble, its natural forms (phylloquinone and menaquinone) have no known toxicity. However, a synthetic form (menadione) can causes liver damage, hemolytic anemia (red blood cell damage) and severe allergic reactions. Alright, we made it through. Sorry that it took a little longer than I said, but there is a lot to talk about when it comes to vitamins. Most people only think of vitamins when they are taking a Centrum® or giving their children a Flintstones® Gummy, but these amazing organic compounds are on the job 24/7. Now, even though a lot of serious symptoms were just bandied about, we are not trying to scare anybody. Almost everybody suffers from some mild deficiencies and very few fall victim to severe neuromuscular conditions. Eating a diet rich in whole grains, fruits and vegetables should be enough for anyone that doesn’t suffer from an existing condition that prevents vitamin uptake. For those folks, your regular physician will be looking at blood test and advising you accordingly. For everyone else, if you feel better taking a multivitamin, by all means, take a multivitamin. Just be careful not to overdo it with the fat-soluble vitamins (A, D, E and K…well, maybe not natural K. Just go easy on the synthetic K.). Raise your hand if you feel like a nutrition expert. Yeah, woohoo! Okay, now put it down. We still have minerals, trace compounds and water to talk about. That’s right, more knowledge to drop on you next time. This thing isn’t over until the fat lady…drops back down to a sensible BMI, gets her blood sugar in order and starts taking a multivitamin.